The series of four political workshops under the frames of the School for politics and critique 2015 are conceptual flow from the activities of the School for politics and critique 2014 and they aim at enabling a space both for learning on strategies of enacting large coalitions and action within them, as well as to generate new theoretical knowledge on the political challenges of the current context. The School will provide a larger group of activists an opportunity to work with experienced political activists and theorists. The increase in neoliberal policies on the one hand and the increase of the authoritarian practice of governments on the other, continuously produce social devastation, fear and political demobilization of social movements. The lack of strategies for outreach to different social groups by the social activists in order to forge a broad alliance of social actors which will enact strategies of action towards social justice, freedom and democracy, produce a fragmented space for change. We need to unite the progressive forces in action. The lack of a more serious political confrontation to the current neoliberal consensus among the political factors requires the mobilization of a leftist discourse and wide social structures. There is a need to link sectors of labor with other citizen structures in order to organize a political resistance against the terrible social consequences in the areas of freedom, democracy and social justice. At the present moment a serious challenge towards the active political mobilization is the fear and disbelief of the wide popular masses on any political undertaking that would challenge the current governing mentality. 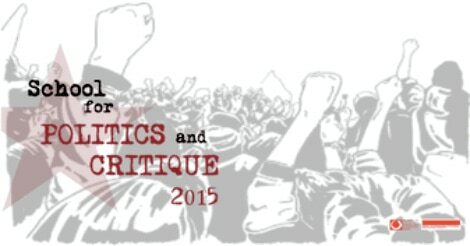 The "School for politics and critique 2015" is organized by the Institute of social sciences and humanities - Skopje with the support of the Rosa Luxemburg Stiftung Southeast Europe. Francois Laruelle - "What's to be done with marxisam today?" Анастас Вангели - "Социјалните движења и политичките партии"
Игор Јованоски - "Секојдневна политика и етика на секојдневието"